A modern-day person living in the United Kingdom shares ancestors with people across the Europe. These maps show where the distant cousins of modern-day people in the UK live, at three different levels of relatedness (recent on top, older on the bottom). Bigger circles mean more ancestors, and numbers give average number of shared genetic ancestors. The further back in time, the more widespread the shared ancestors. Credit: Peter Ralph/USC and Graham Coop/UC Davis. 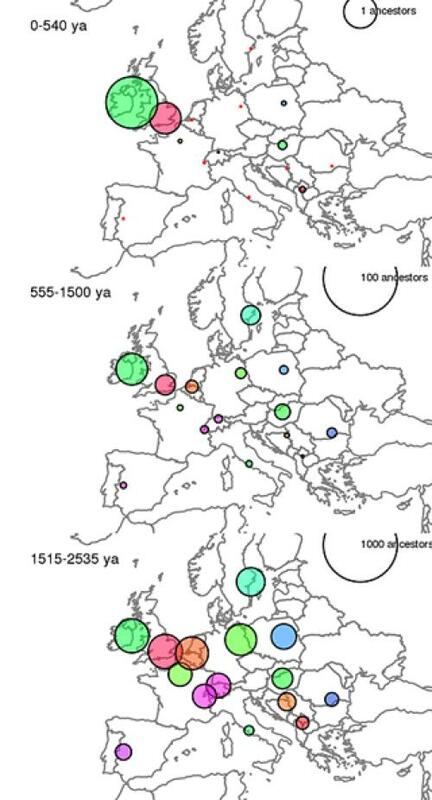 From Ireland to the Balkans, Europeans are basically one big family, closely related to one another for the past thousand years, according to a new study of the DNA of people from across the continent. The study, co-authored by Graham Coop, a professor of evolution and ecology at the University of California, Davis, will be published May 7 in the journal PLoS Biology. "What's remarkable about this is how closely everyone is related to each other. On a genealogical level, everyone in Europe traces back to nearly the same set of ancestors only a thousand years ago," Coop said. "This was predicted in theory over a decade ago, and we now have concrete evidence from DNA data," Coop said, adding that such close kinship likely exists in other parts of the world as well. Coop and co-author Peter Ralph, now a professor at the University of Southern California, set out to study relatedness among Europeans in recent history, up to about 3,000 years ago. Drawing on the Population Reference Sample (POPRES) database, a resource for population and genetics research, they compared genetic sequences from more than 2,000 individuals. As expected, Coop and Ralph found that the degree of genetic relatedness between two people tends to be smaller the farther apart they live. But even a pair of individuals who live as far apart as the United Kingdom and Turkey—a distance of some 2,000 miles—likely are related to all of one another's ancestors from a thousand years ago. Subtle local differences, which likely mark demographic shifts and historic migrations, exist on top of this underlying kinship, Ralph said. Barriers like mountain ranges and linguistic differences have also slightly reduced relatedness among regions. Coop noted, however, that these are all relatively small differences. "The overall picture is that everybody is related, and we are looking at only subtle differences between regions," he said. To learn about these patterns, Ralph and Coop used ideas about the expected amount of genome shared between relatives of varying degrees of relatedness. For example, first cousins have grandparents in common and share long stretches of DNA. Ralph and Coop looked for shorter blocks of DNA that were shared between cousins separated by many more generations. Because the number of ancestors doubles with every generation, the chance of having identical DNA in common with more distant relatives quickly drops. But in large samples, rare cases of distant sharing could be detected. With their analysis, Coop and Ralph were able to detect these shared blocks of DNA in individuals spread across Europe, and calculate how long ago they shared an ancestor. Coop and Ralph hope to continue the work with larger and more detailed databases, including much finer-resolution data on where individuals lived within a country. However, Coop noted that while studies of genetic ancestry can shed light on history, they do not tell the whole story. Archaeology and linguistics also provide important information about how cultures and societies move and change. "These studies need to proceed hand in hand, to form a much fuller picture of history," Coop said. Paper: Ralph P, Coop G (2013) The Geography of Recent Genetic Ancestry across Europe. PLoS Biol 11(5): e1001555. doi:10.1371/journal.pbio.1001555.